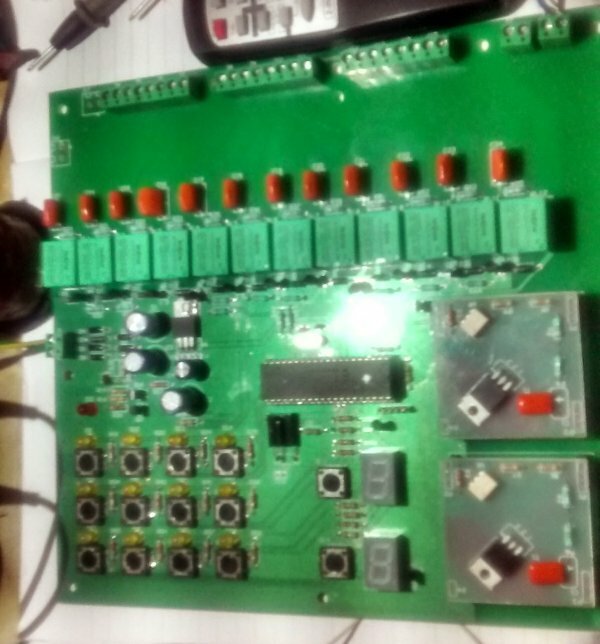 as extension to IR(infrared) Remote Control Relay Board with PIC 12F675 Microcontroller i have done this quite a useful project after too many requests. by using this hardware user have option to turn up to 12 relay on and off and two loads (like fan or motor) can be controlled with adjustable speed in case of motor , or adjustable intensity in case of a bulb. this project is directly involved with high voltage AC which may cause sever damage. proceed with caution. i will not be responsible for any risk involved, you are on you own. the main PCB contains all the components except dimmer triac , they are mounted on separate removable module kind of pcb which can be inserted either one of them , both of them or none of them as per requirements if dimmer functionality is required. as parts availability was primary concern so whole schematic is designed around very basic components , the system is built around only one microcontroller PIC16F877A which is quite cheap in terms of cost and performance. but as this part is available in most part of the world easily it is a good choice. there are total 12+2 switch button on the main board. 12 switches can be used to turn any relay on and off and other 2 switches are used to control dimmers from 0 (off) to level 5(max) each time you press associated button dimmer will increase one step to max. all the relay and both of the dimmers can be controlled by the NEC protocol based remote. as all triac based AC application require some sort zero crossing detector , i have implemented a very simple transistor based Zero crossing detector which give really nice output, but it require pulsating DC input , which come from the System power Power transformer and few diodes. this particular design always require a transformer based power supply for the triac operation , if are using only relay and not using Traic dimmers then only you can opt for SMPS or any other power supply with current design. it is possible to have the whole system including Dimmer to work with SMPS. but that will require separate isolated zero crossing detector . all the latest source files, PCB gerber, Schematic PDF are available on github. or you can download from this direct link (may not be latest) .